Irish isn’t a “toy” or some kind of “cool” code. It’s the heart and soul of a culture. I swear I don’t go out looking for bad Irish tattoos. I don’t take any particular delight in tearing apart peoples’ expensive ink. 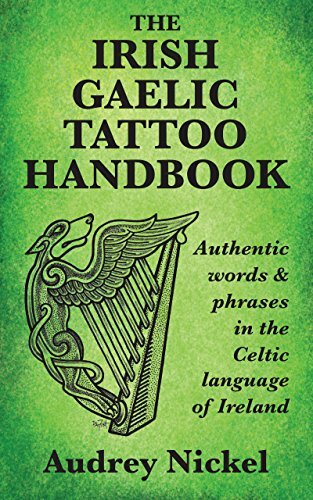 It’s impossible to be involved with Irish on the internet for any length of time, however, without encountering bad translations — and way too often, those bad translations are written on someone’s skin. It saddens and angers me that people misuse the language in this way. Irish is a living language. It’s not a toy, or some kind of “cool” code. It’s the heart and soul of a culture. Just as important, the more bad Irish there is out there, the further the language is diminished, and the harder it becomes for people who truly care about the language to find good translations. When things such as this come across my desk, therefore, I have to say something, if for no other reason than to make it clear to people that doing your own tattoo “translation” without the help of experts is both a recipe for disaster and a profound insult to the language. Some Irish speakers really dislike the casual use of the language for such things as tattoos, and feel that this kind of use in and of itself degrades the language. There are people out there who flatly refuse to do tattoo translations for that reason. I look at it from a different point of view. People are going to use Irish in tattoos whether we Irish speakers like it or not. Most of them have their hearts in the right place. They want to honor their Irish heritage, or the Irish heritage of a loved one. I’d rather help people get things right than make fun of people who get it wrong. That said, I do think it’s important to point it out when things DO go wrong. Incorrect Irish does nothing to help the language, or to help other tattoo seekers, who may emulate your mistakes. So What’s Wrong With This One? When I mention that a particular translation is incorrect, people inevitably ask me what’s wrong with it. In order to know that, the first thing is to ascertain what the “translator” intended to say. I guess I don’t NEED to tell you that he he messed it up big time. But, being me, I really do HAVE to tell you: He messed it up big time. Let’s start with the first word: Beo. It’s pretty clear that this tattoo seeker started out (at least) with an internet or dictionary search for a translation of the English word “live” in Irish. As I mentioned in my post “Even Racists Got the Blues” (and which I’m certain is clear to you once you think about it), English has two words that are spelled “live”: One that rhymes with “hive” and one that rhymes with “give.” Unfortunately, this “translator” grabbed the wrong one. Two words that are spelled in the same way, but that have different pronunciations and different meanings are called “homonyms.” English has a lot of them. That’s why it’s so very important to be aware of “parts of speech” (a term you may remember from grammar school). When you look up a word in any dictionary, you’ll find that it’s marked as belonging to a particular “part of speech”: For example “nouns” (words that stand for people, places, or things), verbs (action words), adjectives (words that describe nouns), or adverbs (words that describe verbs). When you’re translating, especially when dealing with words that are homonyms in the source language, it’s especially important that you pay attention to these parts of speech, because they almost certainly will be represented by different words in the target language. The Irish for the verb “live” is mair. In a sentence such as this, though, it would probably be expressed as a wish: Go maire tú… (“May you live”), if it were to be used at all. Even more likely would be a completely different construction, which I’ll get to in a bit. Our tattoo seeker did get one word right in this phrase: Saol does indeed mean “life/a life” (It can also mean “world.” It’s a versatile word). The problem is with the adjective: mór. Mór has a lot of potential meanings. Its primary meaning is big/large, but it can also mean “great” (as in size or age, not as in “wonderful”). It can also mean “grand/elder,” as in máthair mhór (a term for “grandmother”). In fact, the phrase saol mór has the specific meaning of “the whole world/everybody,” which doesn’t make any sense at all here. If you want to say “a good life,” in Irish, you’d say saol maith (there are almost certainly other ways to say it, but that’s a direct translation). I’ve been wracking my brain trying to figure out where he got “saol mór” for “a good life.” I suspect he saw the word “great” as one of mór‘s possible definitions and assumed it meant “great” as in “wonderful” or “terrific,” but that’s just a guess. Our “translator” got part of the second phrase correct as well. Saol fada does, indeed, mean “a long life. As the proverb says, even a broken clock is right twice a day (well, assuming it’s an analog clock, anyway). So How Should You Say It? Is fearr rith maith ná droch-sheasamh (“A good run is better than a bad stand” — i.e., discretion is the better part of valor). I would also, however, suggest that he seek out a professional translator (if it’s worth having it on your skin forever, it’s worth paying a little for a good translation, am I right?). If a professional is out of the question, I’d strongly encourage him to visit The Irish Language Forum, where there are lots of people with good Irish who can weigh in on the best way to express what he wants to say. In fact, I think I’d encourage him to visit the forum even if he does get a professional translation, for a little peace of mind, if nothing else.